Do you have a prized rug in your home that you love? Is it looking a bit soiled? Are there some stains on it that you just don't want to attempt to clean yourself? UCM Cleaning Services's free pickup and delivery of rugs can help you out with all your rug cleaning requirements and you don't have to lift a finger! Our free pickup and delivery of rugs provides a fantastic service that will come to your home for free, pickup your rug, take it back to our in-house facility, perform a thorough cleaning of your rug, and bring it back to your home at no extra cost. Our free pickup and delivery of rugs is a service that treats your rugs with the utmost care and attention. 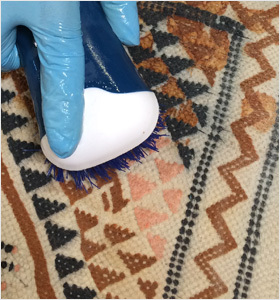 The type of weave, fibers and dyes that have been used to create your rug are checked before treatment begins. A corner is also tested for color fastness so that you can be assured of no damage to the rug. Once a treatment has been discussed and decided upon, it is performed in a matter of hours by our in house team and their cutting edge equipment. We will return your rugs richness of color and softness in less than 24 hours. Our rug cleaning service is an efficient and professional service that can revive your old tired looking rug. We put our customer's convenience first by offering a free pickup and free delivery service, cutting out the time and hassle that you will experience having to drag your rug yourself. Call us at 856-733-0100 today for more information!